Note at the start of the video, she asks her male friend if he has scissors, a clear threat to forcibly cut his hair -- shades of 1960s right-wingers assaulting hippies. He tries to leave, she grabs him and pulls him down the stairs. Not only is this a criminal assault motivated by historical ignorance (locked and matted hairstyles have been found in many cultures outside of Africa) and ontological confusion (culture is not property and doesn't belong to anyone), but nonsense like this makes it that much more difficult to deal with real incidents of racial oppression -- a "boy who cried wolf" phenomena. Authoritarian behavior from the social-left meant to promote someone's idea of "progress" is no more acceptable that authoritarian behavior from the social-right meant to promote someone's idea of "tradition". 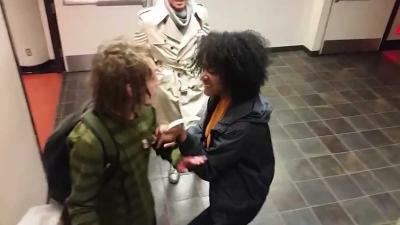 In a video published on Monday, a black female said to be a campus employee accosts a white male said to be a student at San Francisco State University out of hostility to the “cultural appropriation” of his dreadlock hairstyle. As the white male attempts to leave up a staircase, the black female grabs his left arm sleeve. Giving in to the pull, the white male demands to be left alone as he descends back to the main floor.